What is the CC Agent application ? 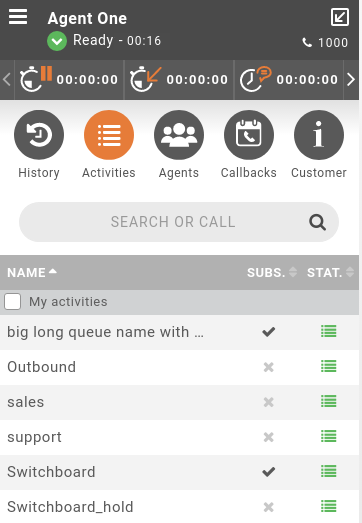 CC Agent is a Web application for contact center operators. Some parameters for Recording, Callbacks, Queue control, Pause statuses and Sheet popup may be configured. Instructions can be found in the configuration section. Manage your activities you are subscribed to receive calls. The web application can either be displayed in a minimal bar or be extended as seen in screen shot below when launched as standalone application. See desktop application. 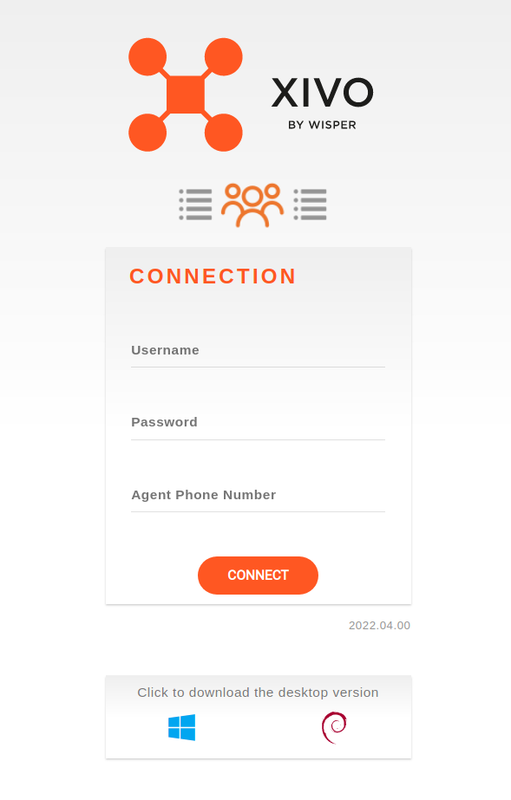 The application offers support for the WebRTC lines, currently there’s a limitation on complementary services like conference or second call which are partially supported. Enter your XiVO client username, password and phone set you want to logged to on the login page. At the top of the application, computed statistics from XUC are displayed to monitor the agent activity. Simply hover the icon to know its definition. They are updated once current action is over. Once logged in you are automatically redirected to activities view, this view contains the list of activities you are registered in. It is possible to filter on favorite activities just by clicking My activities check box. You can manage subscription if allowed globally for the application (see CC Agent configuration). If enabled you will be able to enter/quit an activity just by clicking on checkbox associated to it. Each time you enter an activity, it is automatically added to your favorites. 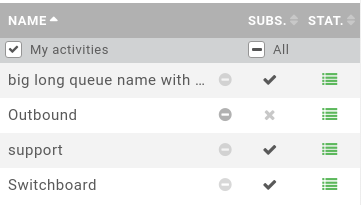 At any time you can remove it by clicking on minus sign next to the name in My activities view. You can remove an activity if and only if you are not already registered in. It’s also possible to enter all your favorites activities just by one click on All checkbox. A little badge displays the number of waiting calls in each activity. 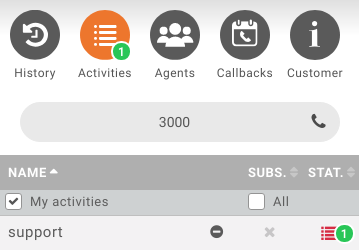 The sum of all waiting calls in the agent activities is displayed in top menu and refreshed in real time. The search support is limited so far to simple words without spaces and simple characters. 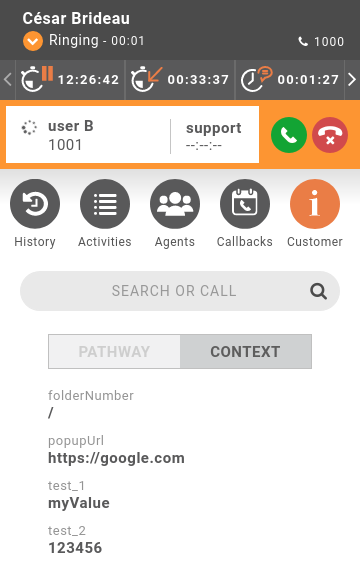 A simple click on the phone icon when agent is hovered will trigger a call to its phone number associated. By default, agents are shown only if they are logged in (checkbox Logged checked). By unchecking the checkbox Logged, you will see all the agents of your group even if they are logged out. This panel will display the current caller name & number and also the associated activity if the call came from one. 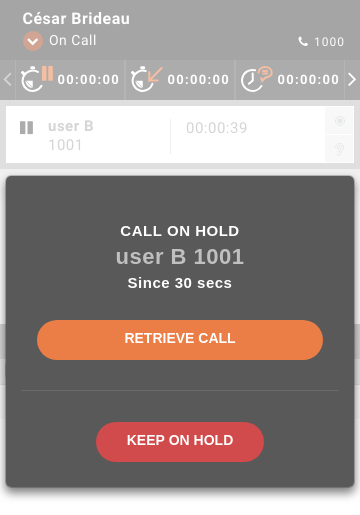 You also have two indicator on the right side letting you know if the call is currently recorded and if the call is currently listened by a supervisor. By hovering your mouse on the call line, an action pane will slide to display action button on the related call. The available buttons depend on the call state. The transfer support is limited, to transfer a call you need to write the number to the search field, then click the attended transfer button and then you can complete the transfer by the complete transfer button. 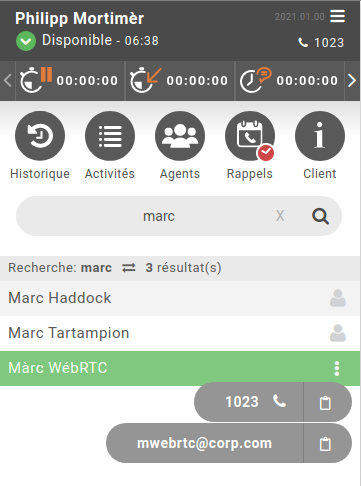 Conference and second call except the attended transfer are not supported for agents with webRTC lines. Also see the phone integration Known limitations. 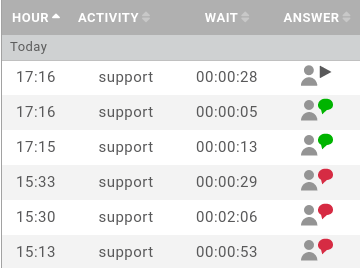 First menu History tab is displaying the call history of connected agent. By clicking on phone icon you will be able to call back if needed. Pay attention that agent history is not the phone device history, but his call activity independently the device he is connected to. Actually when agent is logged out, if a call is received on his last used phone, nothing will be shown in his history. A call answered by another agent from the queue, will appear as answered in the history of the first agent. 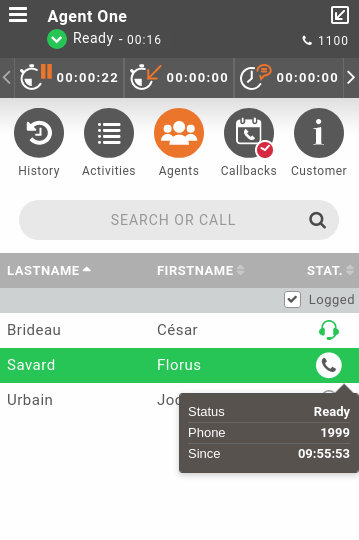 Meanwhile phone is ringing or discussion is ongoing, it is possible to have a quick overview of the customer call history of the caller just by clicking information menu. 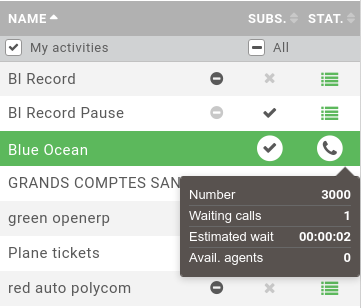 If a call is answered ( green icon ), hovering the line will give the name of the agent who took the call. Second tab of information menu displays all attached data enriched to the ongoing call or display Sheet fields if you are using Sheet Configuration. It’s also possible to trigger either to open a web page, see Screen Popup or completely integrate a third party application while agent is having calls, see Configuration. 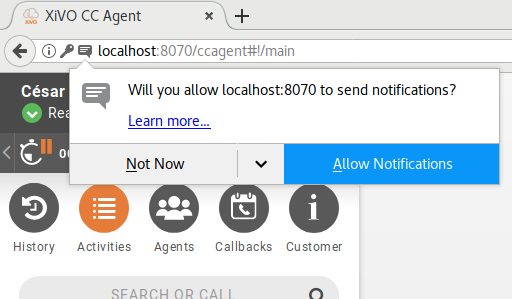 This view allows to manage callback request see Processing Callbacks with CCAgent for details.